A Must win game for the Champions to stay in contention, With points table being tightly packed, every game for every one is important. Not the same for the opposition as they already qualified for the party spoilers list, however two back to back wins, will boost their confidence and will look it to make it three in a row. Dhoni won the coin and decided to bat first, typical Chennai wicket, can’t expect anything else from the captain winning the toss. Chennai dropped Hussey for Ben Hilfenhaus and Saha made way for Vijay, who opened the innings with in form opener Faf, Just when Murali vijay was looking good, thrown his wicket away for 14. Raina joined faf to rotate the strike and clear fences quite sometimes as well, as they got 64 runs between two. Dhoni who didn’t impress much played a handy knock and Bravo finished with a flourish as CSK ended with 160 runs on board. 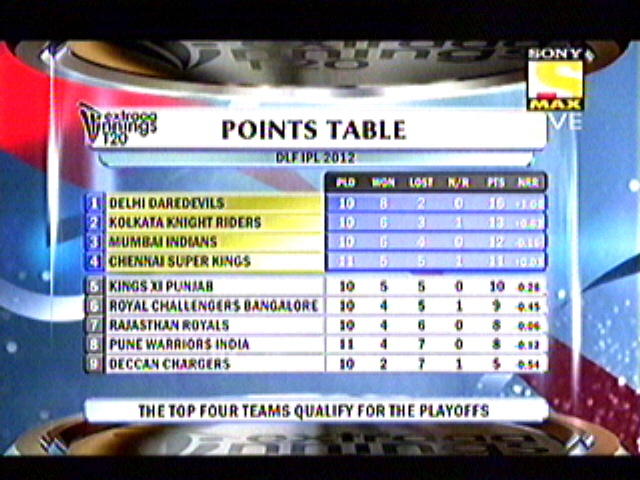 DC bowled well to keep CSK at this score as they looked for much more in the half way time. Again a early blow for DC as they lost Parthiv Patel for 1, where the score was 9/1 in 2 overs, it should have been easily 9/2 if Albie haven’t spilled a return catch from White. 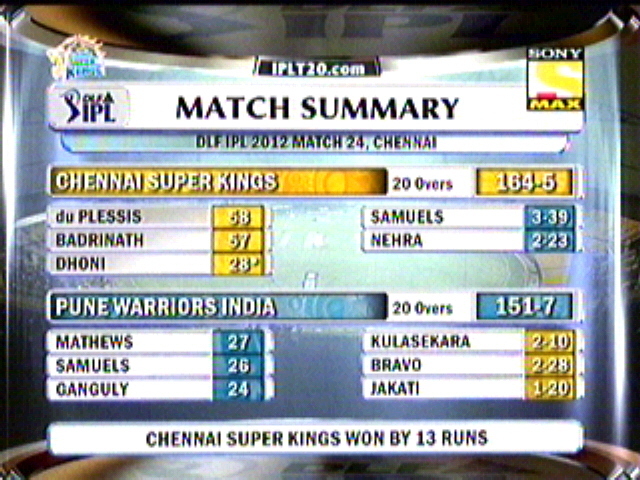 Dhawan along with White made sure run rate was under control and played around CSK bowlers very well. Until Bravo found a bizzare way of getting Dhawan out after he booted a tough catch to runners end stumps to find Dhawan out of crease. Tha man with golden arm Raina this time turned gold again as he plucked Sangakarra with a brilliant return on handed catch. Game was gone by then, White tried his level best bring DC back, once he fell short of gas while trying to get a second to keep strike. Its all done. 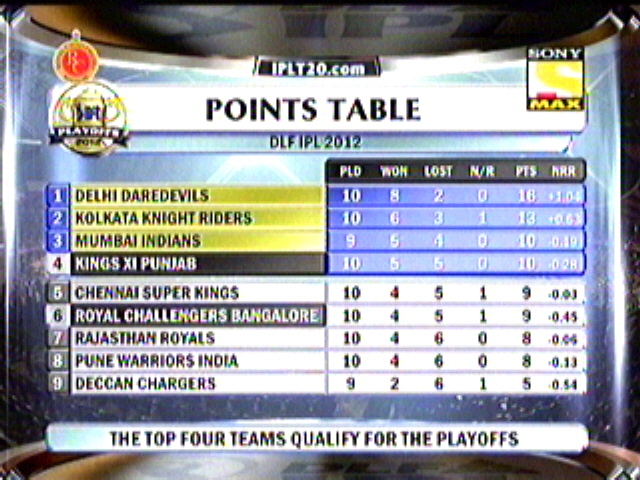 As CSK won the match by 10 runs. 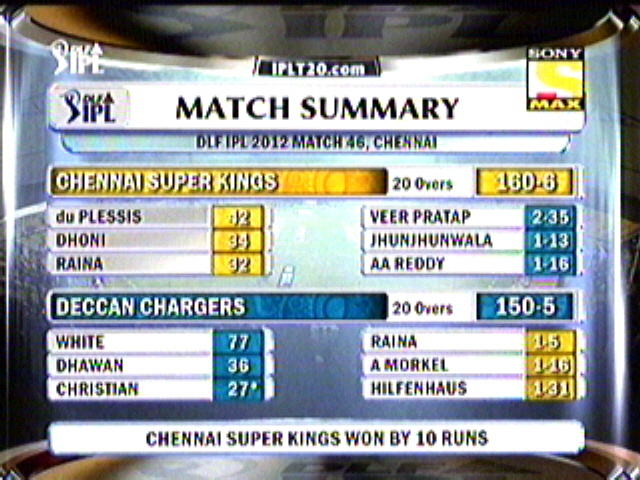 Chennai Super Kings won the match by 10 runs…. – Ben Hilfenhaus made his debut in IPL with Chennai Super Kings. – Cameron White scored the 3rd IPL fifty. – MS Dhoni has won the toss 12 times in his home ground and on all those occasions he decided to bat first. – Suresh Raina & Subramaniam Badrinath are the only two players who haven’t missed a single game in IPL so far, both have played 72 games including today’s one. 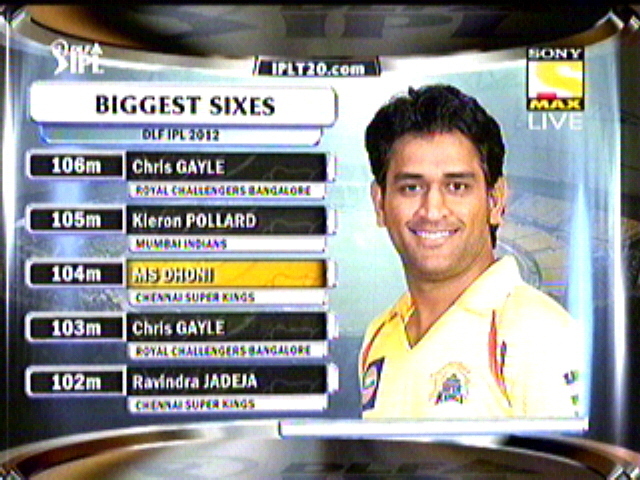 – Suresh Raina picked up his 7th Man of the match award, highest by a Chennai Super Kings player, Dhoni follows with 6 to his name. Pune who is already in a losing streak, if they didn’t put a brake at this juncture, playoff’s will be out of reach even before they could think. 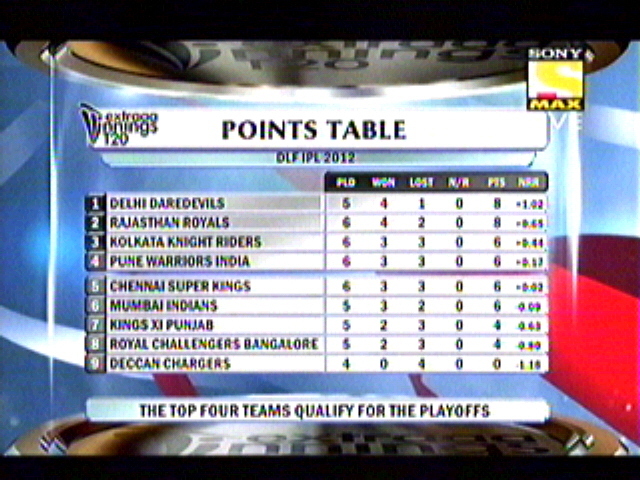 Mumbai need this win to put back themselves strong in the top4. Ganguly spun the coin, but Bhajji won it to bat first, once again Franklin & Sachin gave a 50 runs partnership between them. 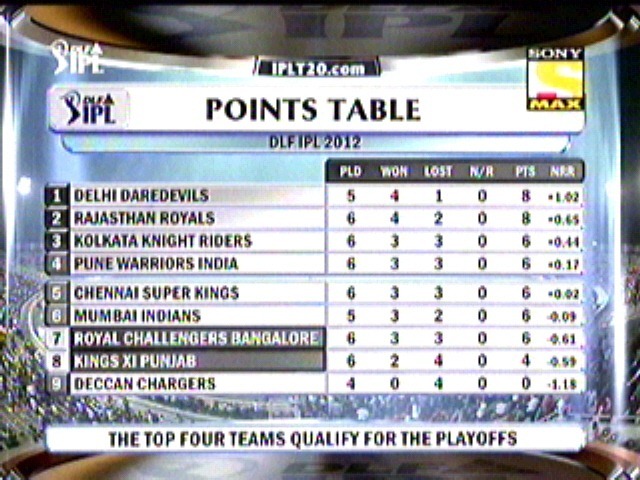 Once they had to depart, Mumbai found themselves a way to dig themselves in a deep hole, as they were 93/7 in 16 overs. 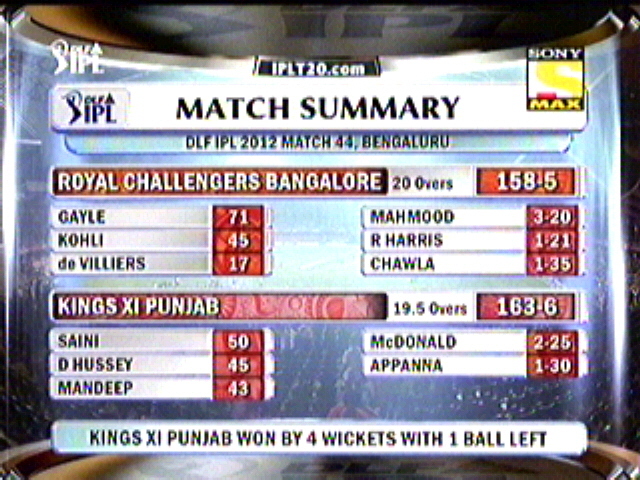 Late swings by Malinga by Bat this time, ensured Mumbai got 120 runs on board. Pune Warriors had 2 points written all over it to for taking, Uthappa wasted the opportunity, and followed his fellow opener Ryder with a poor shot. Clarke was quite unlucky to have a poor decision going against his wish. Smith who was the saviour until was also departed to a Ojha’s spin. Task was cut out in the hands of Skipper Ganguly & Mithun Manhas who were the last recognised batting pair to take them home in front of their home crowd. A big failure from Ganguly which meant 16 runs from 24 balls without rotating strike to Manhas created more pressure in one end, With Malinga bowling at the death, you can’t ask more, he too departed leaving the rest to finish match, which other almost came close were they fell short by just 1 runs. Malinga’s death bowling got him the Man of the match. – Ashok Dinda bowled the 15th Maiden of this season. 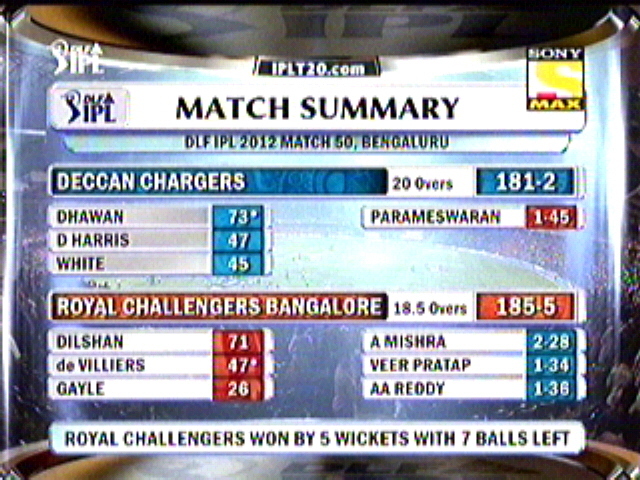 – This is the 16th game for this season which went for the last over. – Both Sachin & Franklin opened the innings for Mumbai on three occasions and on all of those they were able to get a 50 runs partnership between them. 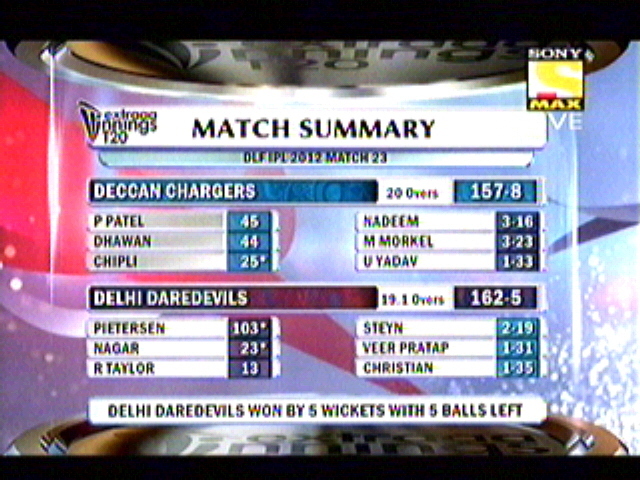 – Second time this season has got a 1 run victory, previous one was between Delhi & Rajasthan, were Delhi scampered by 1 run. 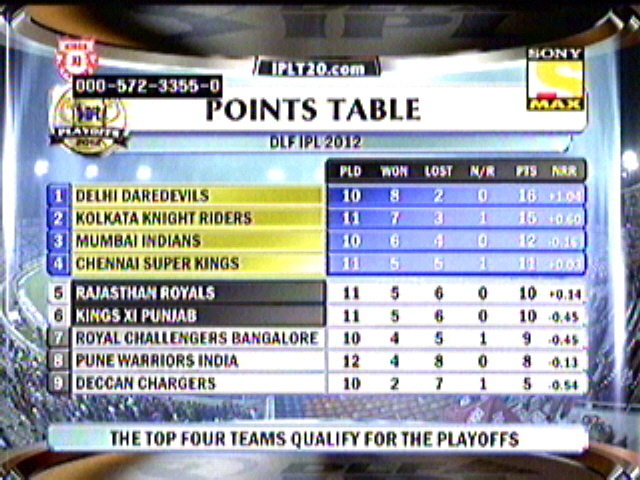 – 120 runs is the lowest score defended for this season, they bettered KXIP’s 135 runs defended against KKR. 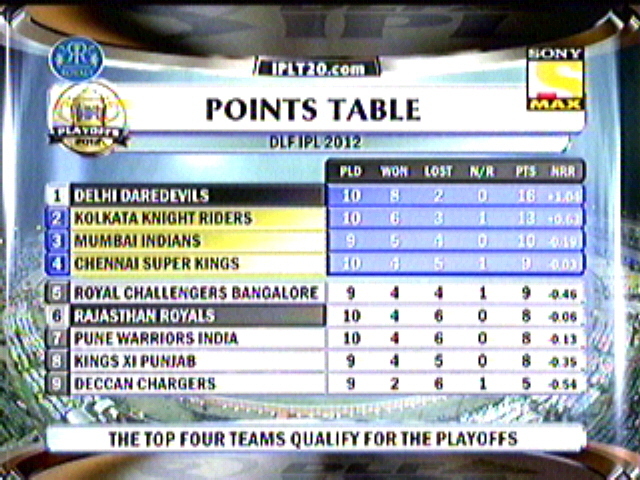 – 120 runs defended was the 3rd lowest in IPL, 116 runs by CSK & 119 by KXIP are the other two. – Harbhajan Single picked up his second Golden duck for this season. Who ever wins this have a bright chance to top the table, which no one will be looking to miss out, early advantage is very much essential in long tournaments like IPL. Shewag won the toss and decided to put Mumbai into bat infront their home crowd, To say as a Mumbai fan, disappointment started right from the toss, and followed till the end of the innings. Where only two of the Mumbai batsmen were able to get to double figures, one being their skipper Harbhajan Singh who had to come in as early as 10th over and fought alone till 19th over for his 33 runs. Rohit sharma being the other to score 29 runs. 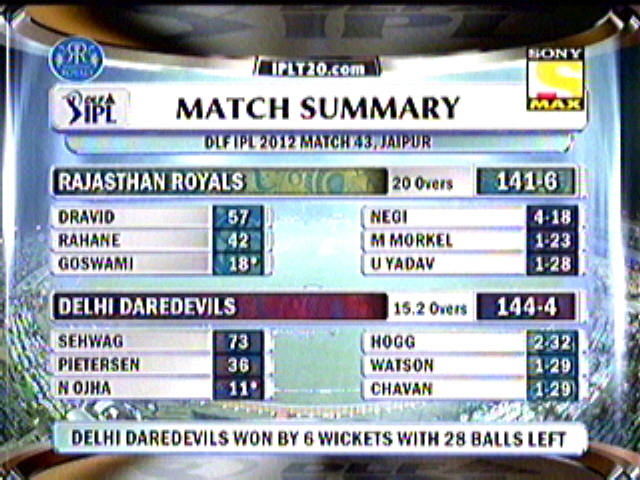 Bowling from Delhi looked completely different and bowlers called their shots. All the bowlers were among the wickets, and kept their strike rate under 6 runs/over, except for Agarkar who went for 27 in 3.2 overs. Having to chase less than 5 runs per over, was as easy as it looked, with batting line up starting with Shewag, followed by Jayawardene,Pietersen & Taylor, best in the business to say. 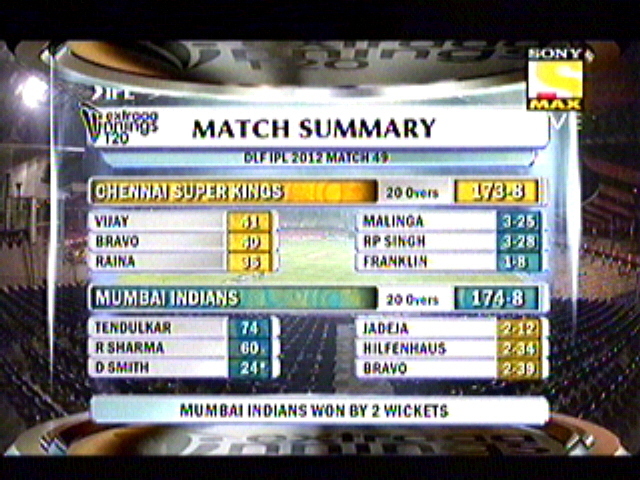 Mumbai tried their level best with some tight bowling upfront, but nothing to stop the inevitable. 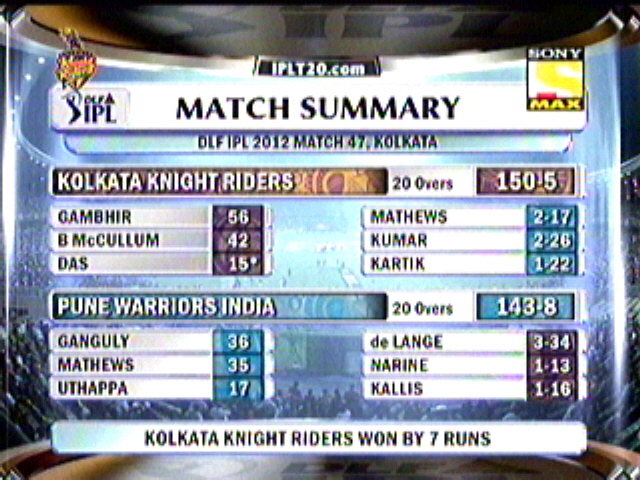 As Delhi crossed the winning runs in 14.5 overs. Shewag being the top scorer with 32 runs. 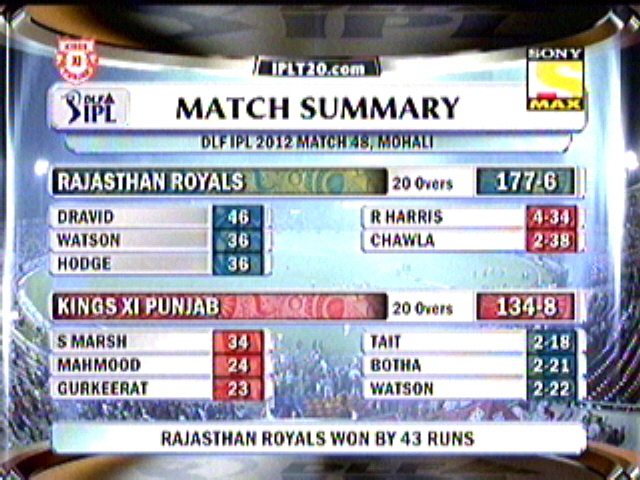 For Mumbai RP singh picked up 2 wickets for themselves. – Pathan & Munaf bowled the 6th & 7th Maiden overs respectively. – 92/10 is the lowest total scored for this season, previous was 97/9 by KKR (rain curtailed match), when in full quota of 20 overs bowled – Mumbai again comes with 101/9 against Pune. 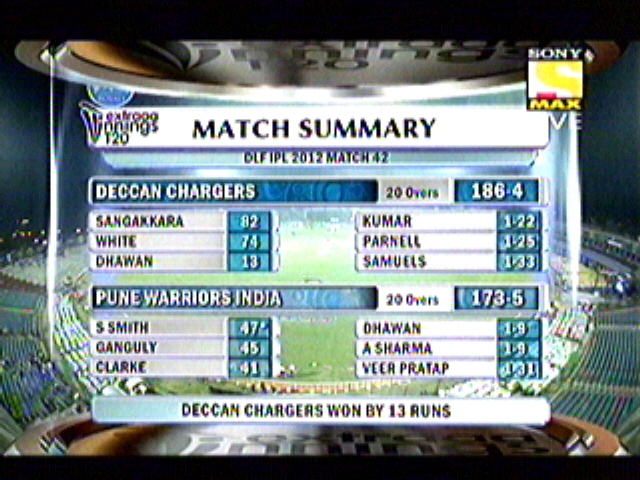 – 185 runs as a match aggregate is the lowest of this season. – Umesh Yadav became the bowler to hold the best strike rate with 2.75 (11 runs in 4 overs), he overtook; Dale steyn unforgettable spell of 12 runs in 4 overs against Mumbai Indians. 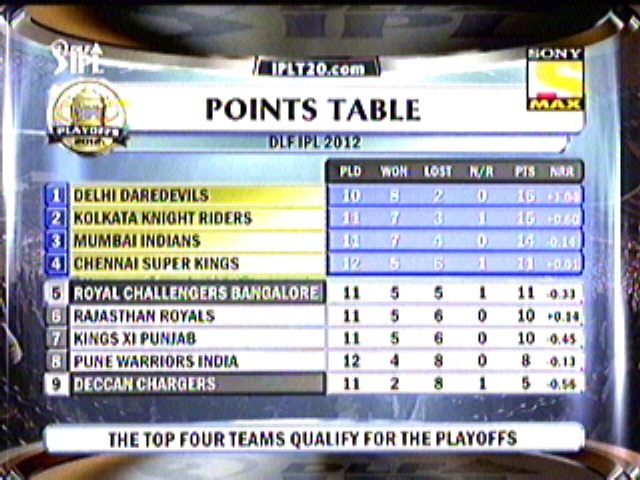 – Victory with 31 balls remaining is the second highest in terms of no. 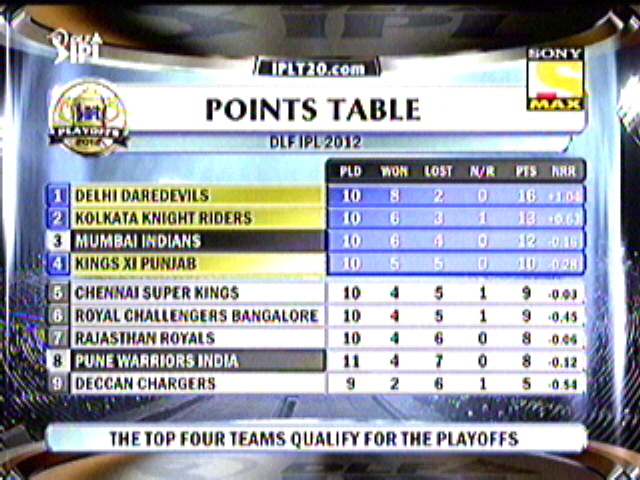 of balls remaining, list topped by Delhi again with 40 balls against CSK.